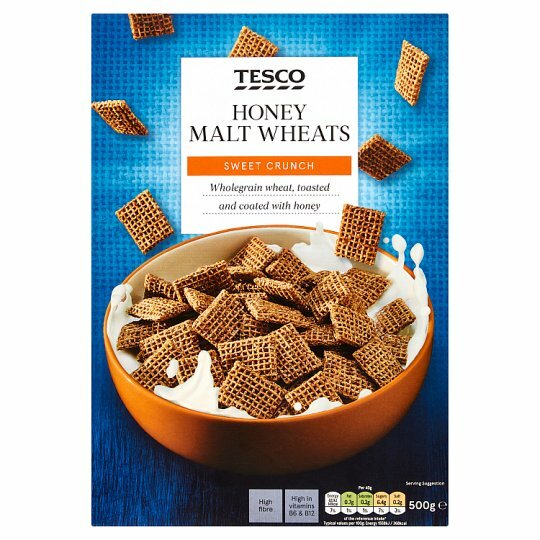 Wholewheat malted cereal coated with sugar and honey fortified with vitamins and iron. SWEET CRUNCH Wholegrain wheat, toasted and coated with honey We love breakfast. That’s why we only work with partners who take pride in what they do and select the most flavourful grains for your cereals – like they’ve been doing for decades. INGREDIENTS: Wholewheat, Sugar, Honey (0.6%), Barley Malt Extract, Salt, Flavouring, Molasses, Niacin, Iron, Vitamin B12, Pantothenic Acid, Vitamin D, Thiamin, Vitamin B2, Folic Acid, Vitamin B6. May contain milk, peanuts, almond and hazelnut. For allergens, including cereals containing gluten, see ingredients in bold. Also, may contain peanuts, nuts, milk and oats. Store in a cool, dry, odour free place. To retain freshness fold down inner bag after use., Contents may settle during transport.